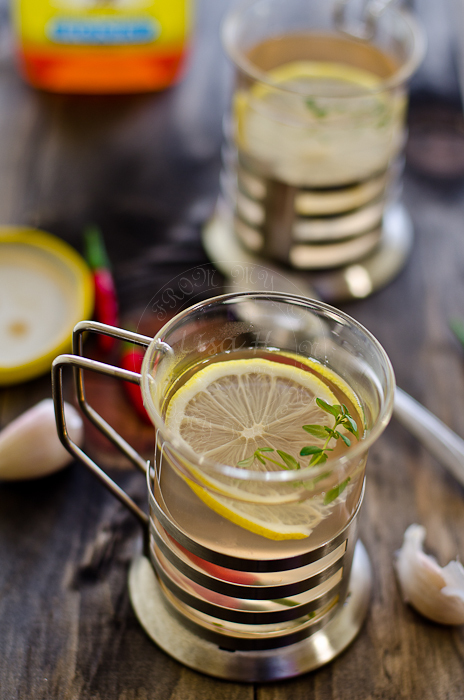 Herbal recipe of Flu tea is an excellent, using natural herbs and spice to combat cold and flu. Thyme was added to help with respiratory. Me ~ a-ha...what is it about? Me~ 'still blur'... Oh Ok! what's in the fRuitty? Garlic, ginger and chilli have natural heating effect... that quickly warmed up my tummy. Simmer garlic, ginger and chilli in 3 cups of water for 5-10 minutes. Add a sprigs of Lemon thyme. Leave it to steep for another 5 minutes. 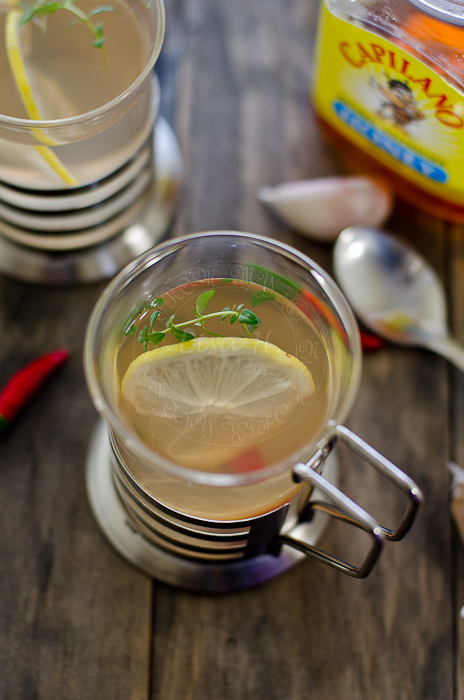 Squeeze 1/2 a lemon and add a teaspoon of honey into the cup. LOL at the conversation between you and H. ;-)) The tea seems quite warm, calming and soothing. So funny! It can be fruity fruit tea ya? Porridge (the watery kind), sometimes works for me. I just drink the "water" from the porridge. Lots of Vit.B and let me sweat out the toxins! Easy to down too, esp when flu means no appetite. very interesting! Love the name, and the tea! How wonderful that it worked for you. There is nothing worse than that stuffed congested feeling you get when you cant breathe. For me, the best way to combat flu is preventative. You have to exercize and eat healthy and it keeps your immune system nice and strong. I also make ginger + honey + lemon.. tastes good and effective! Seeing as my throat is aching today, I am going to have to remember to make this when I get home. I do not make any fruiittee haha! just take vit c ( redoxon ) and if it gets worse, what to do, see a doc!